Stitch multiple: 10, plus 2. Do not cut yarn after each color change. (You can cut the yarn after each color change, if you want, but it will definitely require more yarn.) Carry yarn along sides until the next color change. When changing to a new color, work the color change by pulling the last lp of st through with the new color. Do not pull too tightly on the yarn when carrying it up the side. When working in back loops only, if your last stitch of a row stretches, work the last stitch under both loops. If you find yourself losing count, count every 10 stitches on the row-3 repeat. The 10th stitch is always in the top of the sc5tog. Color Sequence: *2 rows A, 2 rows B, 2 rows C, rep from * throughout. D is only used for trim. 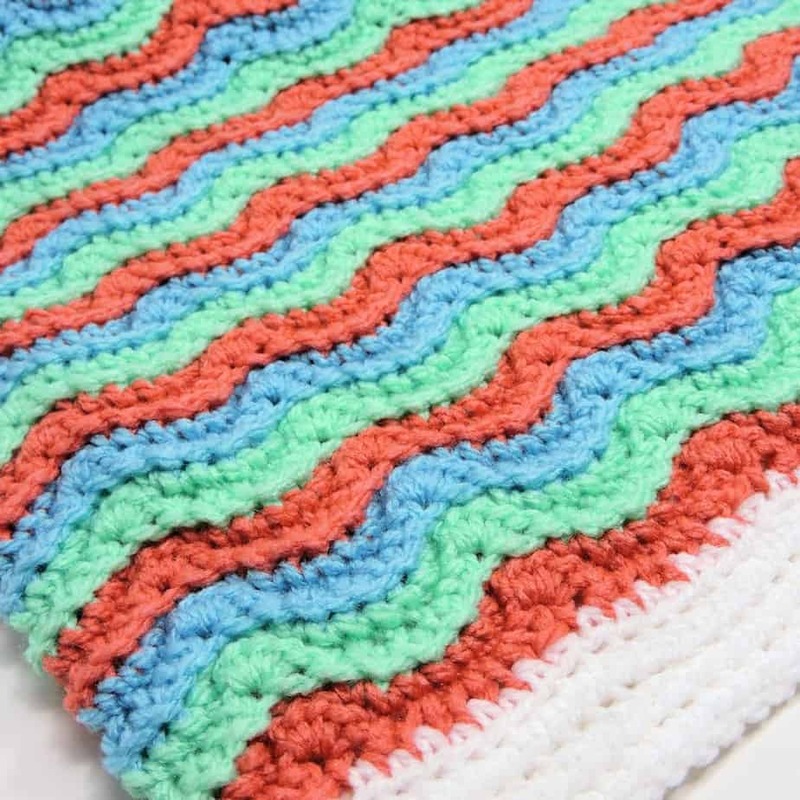 In main body stitch pattern, 22 sts for 14 rows measures approximately 4″ square. Single Crochet Three Together (sc3tog): Insert hook in stitch indicated, yarn over, pull loop through, [insert hook in next stitch, yarn over, pull loop through] twice, yarn over, pull through 4 loops on hook. Single Crochet Five Together (sc5tog): Insert hook in stitch indicated, yarn over, pull loop through, [insert hook in next stitch, yarn over, pull loop through] 4 times, yarn over, pull through 6 loops on hook. Note: When working row 1, I found it much easier to work the foundation row into the back horizontal bar. It made applying the trim much neater. If you prefer foundation single crochet, that will also work for this project as long as your stitches aren’t too tight at the bottom. Row 1 (RS): With A, ch 152, sc in second ch from hook and in each remaining ch, turn: 151 sc. Row 2: Ch 1, working in back loops only, sc3tog, *[sc in next sc, ch 1] 4 times, sc in next sc, sc5tog, rep from * to last 8 sc, [sc in next sc, ch 1] 4 times, sc in next sc, sc3tog (changing to next color in sequence), turn. Row 3: Ch 1, working in back loops only, sc in each sc AND in each ch across, turn: 151 sc. NOTE: Work into the back loop of the chain, not into the chain space. Rows 4-98: Maintaining Color Sequence (see above), rep Rows 2-3, ending with A on last color change, changing to D on last st of last row to begin Trim, turn. Top Edge: Working under both loops, with RS facing and with D, ch 1, 3 sc in first sc, sc in each each sc and ch-1 sp until 7 sc have been completed up to first sc5tog, sk sc5tog, *sc in each sc and ch-1 sp until 8 sc have been completed up to next sc5tog, sk sc5tog, rep from * to after last sc5tog, sc in each sc and ch-1 sp until 7 sc have been completed up to last st, 3 sc in last st.
Side Edge: Sc in side of each row to last row, 3 sc in side of last row. Bottom Edge: Working in unused loops of foundation ch, sc in next 3 ch, *sk ch, dc in next ch, sk ch, sc in next 2 ch, sl st in next 3 ch, sc in next 2 ch, rep from * ending with 3 sc before last ch, 3 sc in last ch. Other Side Edge: When working on this side, use care to ensure that you are crocheting over the color changes if you carried them up without cutting. Sc in side of each row, sl st to first sc. Round 2: Working in back loops only, ch 1, sc in each st around, with 3 sc in 2nd sc of each corner, sl st to first sc. Rounds 3-4: Working in back loops only, ch 1, sc in each sc around, with 3 sc in 2nd sc of each corner, sl st to first sc. Fasten off after final round.